Huang Binhong was born in Zhejiang Province, the grandson of the well regarded artist Huang Fengliu. He studied painting and then spent many years editing literary and art journals in Shanghai and teaching at fine arts colleges in Shanghai and Beijng. In 1948, he moved to Hangzhou and taught at the West Lake Art College. Huang Binhong was a master of freehand landscape painting who was well versed in the works of the great masters of the past and followed many of their techniques. 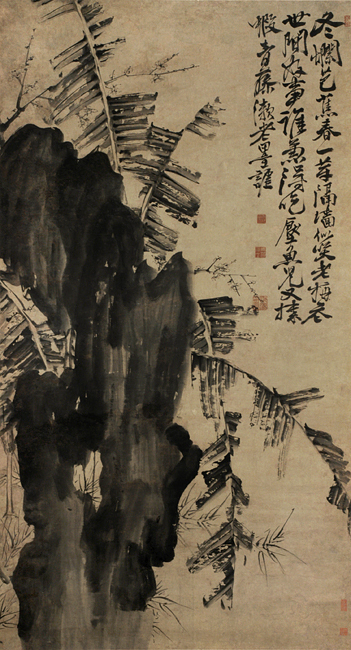 Huang experimented with traditional techniques for the use of ink, including shading and layering. For example, he achieved a simple yet profound effect in his landscapes by the use of thick dark ink over which he applied light or heavy coloring. His work was also known for its powerful brushwork and its fresh approach to composition. In 1953 on his 90th birthday, Huang was awarded the title of “Outstanding Painter of the Chinese People.” After his death in 1955, a Huang Binhong Museum was established in his home in Hangzhou.